I began reading the Sookie Stackhouse novels a few years before the HBO series started. Since I enjoy urban fantasy and had fallen in love with Louisiana on a visit to New Orleans I found a lot to like about the series with its Cajun setting populated with vampires, fairies, and werewolves. I quickly read through the first few novels and the continued along as the years passed. I was pleased with the HBO adaptation, True Blood, which blends in many of the details and the mood of the original work with enough changes that it adds some novelty; keeping one particular beloved character alive especially endeared it to me. Unfortunately over the last few novels I have felt slightly less interested in the story. The characters have seemed less likeable and as the level of gloom over the storylines increased, my enjoyment decreased. I wasn’t ready to bail on them yet the way I had with Anne Rice’s Vampire series around the time that Pandora came out, but I was pleased when I learned that Dead Ever After would be the last book in the series. I had hopes that this novel as a planned conclusion might bring back some of the magic from the earlier books in the series. The book itself playfully pokes at the readers’ expectations with the cover and end pages decorated with images of Sookie’s romantic interests a werewolf, weretigger, shapeshifter, and a vampire. This of course leads to the problem that any series with a love triangle or in this case a love hexagon has that it will never satisfy all the readers with its ending. I didn’t find the end result surprising or unexpected, although I had been rooting for the redemption of her first love, the vampire Bill, who barely was featured in the book. The book does feature appearances of many of the friends and foe that have surrounded Sookie throughout the series, but I would have liked more satisfying conclusions and growth for many of the characters. Although in life people often do not get a happy ending, it is a shame in a series populated with fairies that so many characters instead seem to be settling in the end. For those disappointed in the ending there is always True Blood, which could choose an entirely different love for Sookie in the finale. 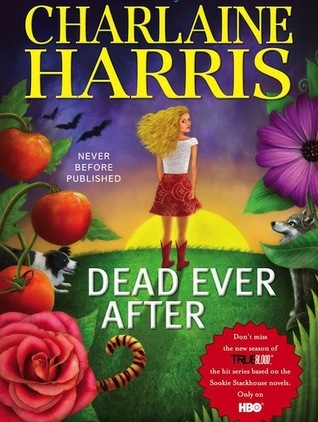 Also coming out around Halloween will be After Dead: What Came Next in the World of Sookie Stackhouse, an encyclopedic epilogue where Harris discusses the lives of the Bontemps residents following the last novel, which may deliver some surprises. I would say for readers who have not yet sampled the series to check out the first few novels, which are a well written pleasure for a nice summer beach read, but if you too begin at some point to feel disenfranchised just borrow After Dead from the library when it comes out and skip ahead to the end. Fans of the Sookie Stackhouse novels should enjoy Kim Harrison’s Hollow series. The Sookie novels are set in present day America (though it was not meant to take place at a set time until post Katrina when Harris incorporated the hurricane into the work and gave it a more fixed timeline). The Hollow novels also take place in modern America, but several decades after vampires and other supernatural creatures came out of the coffin to borrow a True Blood phrase. In their case it was not due to a blood substitute becoming available, but instead due to human society being thrown into turmoil due to a mass pandemic brought on by genetically modified tomato plants, which caused the unaffected witches, vampires, and pixies to step forward to save civilization (throughout the series there are jokes about humans now being terrified of ketchup and pizza sauce). Rachel Morgan is a young witch who uses her magic in trying to solve and prevent crimes. Her partners are a pixie and a living vampire. One of my favorite characters in the novels is Al, a wisecracking demon who becomes a foil for Rachel throughout the series. The setting in Cincinnati gives the books more of a gritty urban feel. 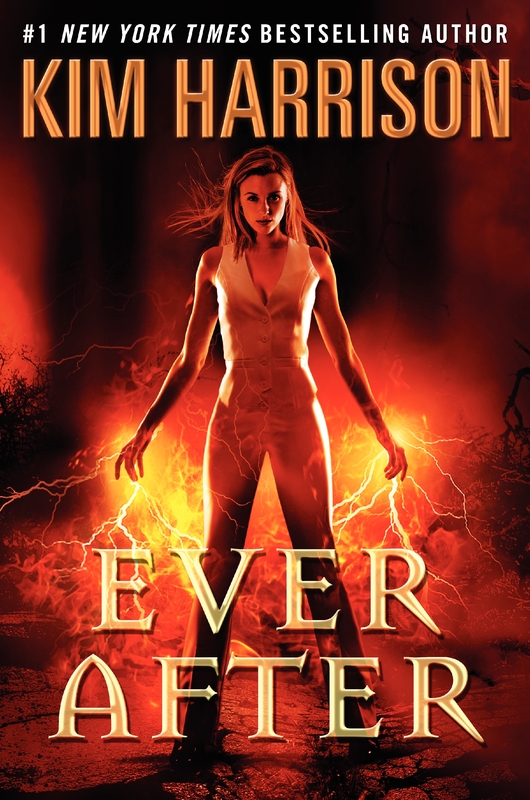 Ever After is the most recent in Kim Harrison’s Hollow series. Although the title may lead you to believe that this is the last in the series, there are actually two more books planned for 2014 and 2015 before Harrison gives her characters their final “ever after”. Although at first the novel started off a bit slowly and could have been edited down about a hundred pages, on the whole it was filled with action, which propelled it on to what could have been a satisfying ending to the series, but left enough room for further character exploration that I’m looking forward to the next two novels. In this series the dark places that the characters are taken to emotionally works well. I like that several characters that had been painted as villains early on have gradually been redeemed. I was reminded of how much the characters have grown and developed when reading recently a graphic novel prequel Blood Work that Harrison wrote about the early partnership between Ivy, a vampire, and Rachel. The novels are best read in order so though Ever After is definitely among my favorites in the series; I would recommend starting at the beginning. If the early Sookie novels are a great beach read, this series is best read with a flashlight on a stormy summer night when the power has gone out. So think about stopping in to the library for one on the next rainy day.